#1 choice for residential pools: D.E. Filters – This type of filter is the most efficient filter available … uses diatomaceous earth as the filtering element which when added to the skimmer as the pump is running, collects on the outside of the filter grids. The pool/spa water must pass through this filter media before returning to the pool/spa. Filters up to 3-5 microns of debris (filters out the bacteria that causes algae). Maintenance – disassemble filter and clean grids 2x/yr. Less operating time for pump than a sand or cartridge filter: recommended to turn all the gallons in the pool 2x/day in the spring & summer, 1x/day in the fall & winter (ex: 20,000 gallon pool using a pentair challenger pump [ pumps100 gallons/minute] = [100 gallons x 60 mintues = 6000], [20,000 / 6000 = 3.33] … pump must run 3.33hrs. to circulate 20,000 gallons through this particular pump. These are considered high pressure filters … recommended filter pressure is btwn. 13-18lbs. 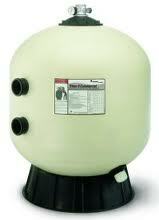 #2: Sand Filters – recommended for commercial pools because they operate better than D.E. filters when running the pump 24 hours a day. Filters up to 40 microns of debris. Doesn’t clog up w/ oils (body oils and suntan oils) from a large bather load as rapidly as a D.E. or cartridge filter. Maintenance – open top and add filter degreaser, stir up sand, let soak for at least an hour, backwash. Also, approx. every five years the sand needs changed (when the sand granules get rounded). Operating time for pump to run is a minimum of 12 hours. Doesn’t filter out the bacteria that causes algae … will filter out body and suntan oils. Also considered high pressure filters … recommended filter pressure is btwn. 13-18lbs. 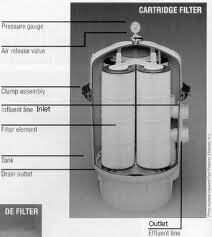 #3:Cartridge Filters – This is our least recommended filter for residential pools (less efficient than D.E. filters and more maintenance than D.E. 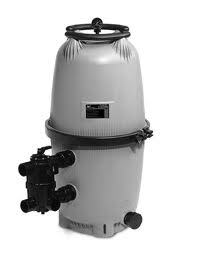 or sand filters) … water passes through paper cartridges before returning to the pool/spa. Filters up to 10 microns of debris. Doesn’t filter out bacteria that causes algae … will filter out body & suntan oils. 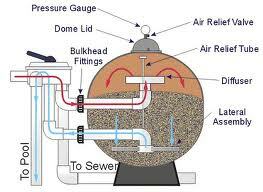 These are considered low pressure filters and must use a 2 speed pump at low setting or a smaller h.p. pump, which either way requires longer running time for pump. 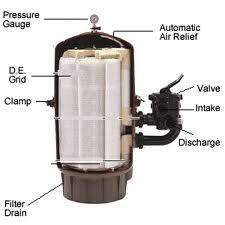 Maintenance – the filters need cleaned at least once a month in the summer. Must disassemble filter and remove cartridges to clean and soak. Operating time for pump depends on h.p. of pump … recommended to turn all the gallons in the pool 2x/day in the spring & summer, 1x/day in the fall & winter. Next Next post: Replacing pool coping by Executive Pool Service ~ McKinney, Tx. Glad to know about this article about filters for swimming pool. Thia is very informative.